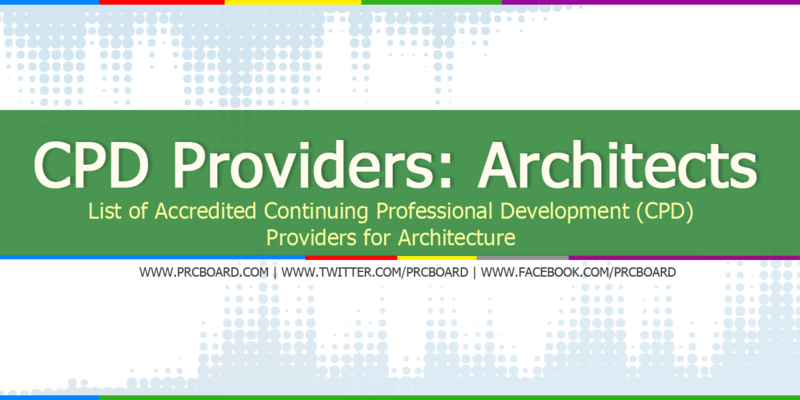 The Professional Regulation Commission (PRC) released the updated List of Accredited Continuing Professional Development (CPD) Providers for Architecture, one of its regulated programs. CPD Provider refers to a natural or juridical person accredited by the CPD Council to conduct CPD Programs as defined Republic Act (R.A.) 10912, "An act mandating and strengthening the continuing professional development program for all regulated professions, creating the Continuing Professional Development Council, and appropriating funds therefore, and for related purposes". Below is the updated list of Accredited CPD Providers for Architecture and the R.A.10912 courtesy of PRC Council. To receive updates on any announcements about CPD Providers for Architects, we advise our readers to bookmark this article, visit PRC official website or follow us at our social media pages via Facebook and Twitter. Decentralize the venues of the CPD. Provide CPD to other cities and provinces throughout the Philippines for easy access and reduce monetary burden to other professionals. How about the architects in the province? Architects in NCR have all the advantages in obtaining their CPD points than architects based in the provinces and abroad. Please create CPD provider branches in all major cities in the country. halos NCR lng?..eh pano yung mga nasa outside NCR? I'm ok with cpd, but not for renewing license. May use to categorize architect's level of expertise na lang sana. Getting license and maintaining it is already a struggle for freelancers....with the yearly membership fees and the likes. Sana sa mga local chapters na lng ang provider. Baka pwede i-accredit all UP campus all over the Philippines that offers post grad, masters and doctorate degree? UST and UP deliman lang kasi accredited universities nyo for architect's cpd eh.